Reference number for this case: Sep-54-Charleville. Thank you for including this reference number in any correspondence with me regarding this case. The regional newspaper L'Ardennais, of Charleville-Mézières, France, had apparently illustrated in their October 1, 1954, the news of an observation by a photomontage made by their staff. This comes from a "skeptical" publication of 2000, Les Mystères de l'Est, where this information appear, with an indistinct version of the photograph in question, and no information about the sighting which had prompted the newspaper to make this photomontage. Explanation: Photo montage made by the newspaper to illustrate the news of a UFO sighting. 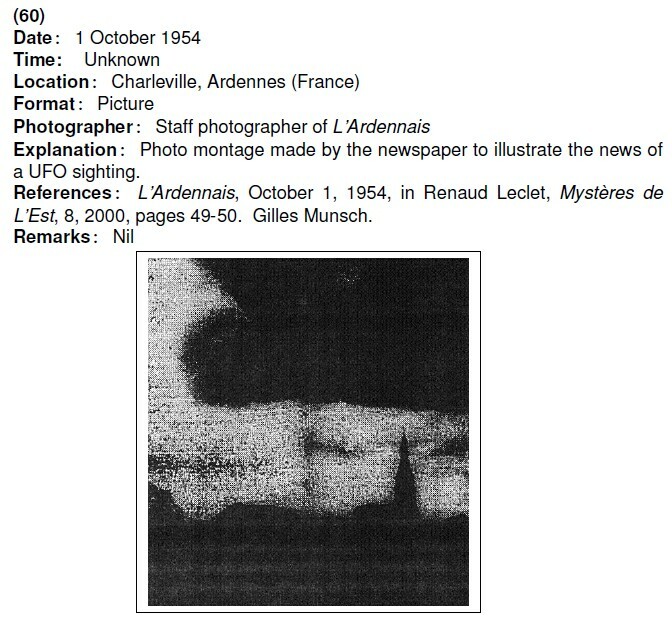 References: L'Ardennais, October 1, 1954, in Renaud Leclet, Mystères de L'Est, 8, 2000, pages 49-50. Gilles Munsch. Photo editing to illustrate a UFO sighting report. [---] Regional newspaper L'Ardennais, Charleville-Mézières, France, October 1, 1954. [---] Renaud Leclet in Les Mystères de L'Est, magazine of the ufology group CNEGU, France, #8, pages 49-50, 2000. [bo1] "El año 1954 en fotos", by Juan-Vicente Ballester-Olmos, in @nomalía, Volume II, #5, Spain, May 2005. [bo1] "The Year 1954 in Photos", by Juan-Vicente Ballester-Olmos, appendix of "Il Quinto Cavaliere dell'Apocalisse, book by Giuseppe Stilo, UPIAR publishers, Italy, 2006. [bo1] "L'Année 1954 en Photos", by Juan-Vicente Ballester-Olmos, French translation, in the Fortean magazine La Gazette Fortéenne, France, Volume IV, 2005. 1.0 Patrick Gross October 10, 2016 First published. 1.1 Patrick Gross February 10, 2017 Addition [ub1].